List the challenges sales reps face when trying to close opportunities. Explain how Einstein Opportunity Scoring makes your sales team smarter when working on deals. 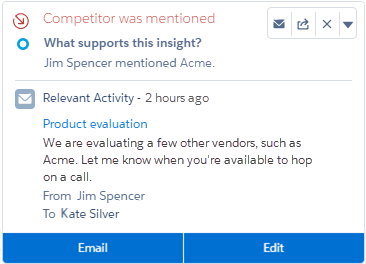 Explain how Einstein Opportunity Insights helps your sales team win more deals. You’re impressed with everything Sales Cloud Einstein has been able to do for Honeydew’s sales process so far. It seems like AI is effective for logging and surfacing critical data points, automating activities, and turning leads into opportunities. But after your talk with Pepper, you know that the real test is still to come. This work is all for naught if it doesn’t help the company’s bottom line. Selling isn’t easy. Pepper and the other managers have great sales teams, but they still struggle with the same issues you’ve seen at other companies. Too many deals. Reps don’t know which deal is the hottest and needs immediate attention. Longer decision time frames across more deals. It’s easy for reps to lose track of where they are with different deals. Losing deals to delays. When a rep is working on several opportunities in the pipeline, it can be tough to know when to reengage with a contact. For managers, getting a handle on the sales team’s deals is challenging. With so much noise, it can be difficult for them to know where to step in to help. That afternoon, you present to Pepper all the benefits that AI can offer for the deal-closing phase of the sales process. AI can score your opportunities so sales reps can prioritize the hottest deals. AI can help identify trends based on your company’s existing opportunity data. As a result, sales reps can see which deals are more or less likely to close based on recent activity. With an intelligent system, sales reps can be reminded to follow up when there isn’t activity over a certain length of time. They can also get notified when key moments in their deals take place. For managers, AI can offer visibility into their teams’ pipelines without asking individual sales reps, and then avert deal disasters before it’s too late. Your answer for using AI to close more deals at Honeydew? That’s right—Sales Cloud Einstein. 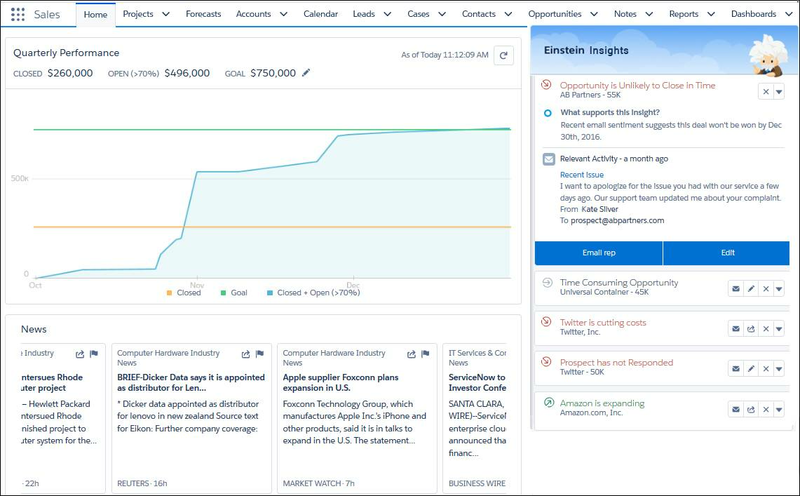 Specifically, the Einstein Opportunity Scoring and Opportunity Insights features. You explain that Einstein Opportunity Scoring works a lot like Lead Scoring. Einstein looks at sales teams’ past opportunities and related information to create a predictive model. From that model, Einstein gives each opportunity a score, which is available on opportunity records and list views. And for each opportunity score, Einstein backs up its claim with the top factors that contributed to the score. In Lightning Experience, the score is shown on the compact layout of opportunity records (1). Reps hover over the score to see the top factors. For example, a score might be relatively high because the opportunity is moving quickly through the stages compared to other opportunities. In Salesforce Classic, the score and factors are shown on the opportunity record detail. You can add the Opportunity Score field to opportunity list views (2). In Lightning Experience, reps simply hover over the score in the list view to see the factors. In Salesforce Classic, the contributing factors aren’t available from the list views. Instead, reps need to navigate to the opportunity record detail page. After reps decide which deal to work on, in comes Einstein Opportunity Insights, which uses machine learning and sentiment analysis to help sales reps close more deals. The same data collection that’s used to log customer data and identify the best leads and opportunities can also move the sales needle. Insights are tailored to the patterns and data specific to your organization. Einstein Opportunity Insights offers smart predictions and follow-ups about different opportunities precisely when they’re needed. The insights are specific to your organization and team, and they appear on the Home page, opportunity records, and in list views. Sales reps can see all the insights related to their deals on the Home page. The Home page also features actions relevant to different opportunities, such as the ability to edit an opportunity’s close date or email a contact who hasn’t responded to a request. Reps can dismiss insights or leave feedback about the relevance of individual insights. On an opportunity record, reps can see all insights related to an opportunity. Admins can also customize list views to show insights. You finish your presentation by describing the three different flavors of insights included with Einstein Opportunity Insights. Deal Predictions—Your reps see predictions based on recent activity and existing opportunity data. For example, whether a deal is more or less likely to close, or if a deal seems unlikely to close in time. Follow-Up Reminders—Reps get reminders to follow up when a contact hasn’t responded in a while. They also get reminders if there hasn’t been any communication related to an important opportunity for a significant period of time. Key Moments—Reps are notified at key moments related to a deal, such as when a contact mentions a competitor or is leaving their company. Use these resources to learn more about Einstein Opportunity Scoring and Einstein Opportunity Insights.